I've always been someone that loves to color there hair, as many girls do! The truth of the matter is I've coloured it many different colors from off my 16th Birthday! It's been Cherry Red, Chocolate Brown, Soft Black, Maroon, Black Blue and of course now SUPER Black! I personally never went to blonde (or light browns) as I thought that was not really my color, but that's the only reason I never turn my hair LA Blonde! Now I know the dangers of colouring ones hair, there's no way to escape the fact that dyeing your hair causes damage to hair Slightly or Severe, hence why I loaded my shopping basket with lots of hair care products to help my hair along in the damage department & there are also the health risk! for those of us that are more prone to them like me it is more then just hair damage we (I) risked. I knew I wanted something AMMONIA FREE, as that's what is one chemical I refused to have in my Hair Dye. 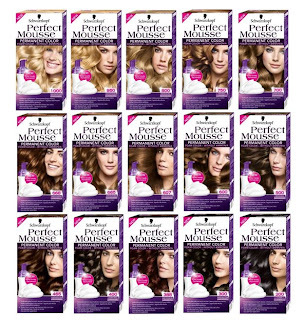 Going though the Hair Colouring isle I remembered one of my really close friends saying they coloured there hair Gingery Brown with Schwarzkopf Perfect Mousse Hair Dye!. I found this at my Drugstore all the way at the end of the Hair Care & Hair Colouring isle.......In many Different shades and Ammonia free. I ended up choosing there Black as I love how it brings out my Blue eyes and I love Black hair anyways. When I came home I went to color my hair straight away as I have been no strange to hair dyes before I started on the process to change my hair to Black!. In the box you'll get Gloves, Color Mixture, A bottle with Color activate in it, Hair Conditioner, Booklet (instructions) & a pump lid to put on the bottle. After you add the Color Mixture to the Color activate you put on the Pump lid and do NOT SHAKE but tip the bottle upside down and then back up again, after that with gloves on you start pumping out the hair color on your hand. Now as the name suggests this will come out like a mousse, you apply it to the hair all over and make sure to cover everything. 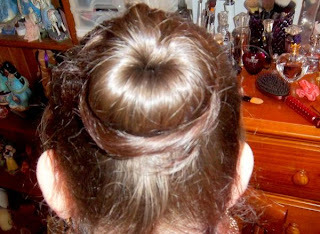 When all is covered you massage it in like you would shampoo then leave in hair for 25 to 30 minutes. Though the waiting time I personally didn't get a headache like I offen do, I only noticed a cap like feeling & it was itchy but that is the dye doing it's work. 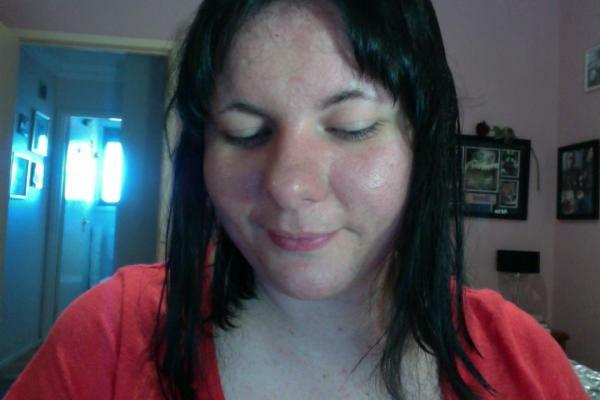 In about 15 minutes what was white mousse on my hair was now VERY black paint color! I continued for another 10 minutes then went to wash it out in the shower. Washing it out was easier then any of the other hair colors I had used in the past & it did not feel to OVER damaged, I used the Hair Conditioner that came in the box and applied this to the hair leaving it in for 2 minutes, washing that out I was now finished. Thankfully my Hair was not to dried out after using the Schwarzkopf Perfect Mousse Hair Dye, My hair felt pretty good, there where not to many tangles either after washing the hair which I hate as it normally comes with hair coloring for the hair to be a tangled mess. I will condition it further as it does need a little help but I have lots of products that will bring it back to super healthy hair in no time! Overall I really enjoyed using the Schwarzkopf Perfect Mousse Hair Dye & I'm very Pleased and Happy with the results, it left my hair with an even rich super dark color that was true Black, not overly damaged hair & no problems while in the coloring process.